When you start searching for information about wall tents, you will find there are many wall tents designed without any modern inventions like zippers, Velcro, snaps, mosquito netting, modern nylon rope or even tent stakes unless they were handmade by a blacksmith. 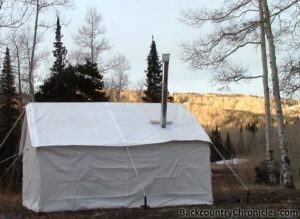 Our Elk Mountain Wall Tent has zippered doors and screens and wood stove keeps it very cozy. There may be nothing to help keep out the cold winter breeze except a string to tie the door flaps shut. These tents are designed for “re-enactors” looking to recreate a “period” experience from the past. Assuming that you do not have such an aversion to zippers and Velcro, there are several basic things to consider that will make your camping experience more enjoyable and your wall tent last longer. If using an internal frame, foot pads help to prevent dirt from going into the bottom of the leg poles. Foot pads also prevents leg from working down into soft ground and prevent legs from damaging the sod cloth. Foot pads are nice, but if ordered with the tent, can cost as much as $10 each. We use plastic pads that are made to prevent furniture from making dents in the carpet and have also used wood chips when we forgot the carpet pads. When you are ready to order a wall tent, there are many options to consider. Internal wall tent frame roof section. Includes ridge poles, side poles, 3-way and 4-way angles for connections. If you are considering a wall tent or if you already have one, there are many extras that are available to add space or organize all the gear. We didn’t include a tent fly when we ordered our wall tent, but a tent fly is important for the many reasons (listed below). It is simpler to order the tent fly from the same place you buy your tent and you can be sure the tent fits properly and it will already have a hole for the smoke stack. We made a tent fly out of a tarp that was larger than our tent. I made the hole for the smoke stack by burning a circle. I also made a metal spacer from several large (gallon?) sized tin cans. The spacer slides over the stove pipe and prevents the tarp from touching the hot smoke stack. Our tarp is inexpensive and will probably not last longer than four or five years, but the main purpose of the fly is to protect the tent from burn holes. Check out our Wall Tent Size Guide for specifics on choosing a size for your needs with layout examples. Q: What are the most important features you are looking for in a wall tent? Let us know below in the comments. This guide is perfect! I like this post so much. So helpful and informative as well. Thanks for sharing! This is an awesome primer. I am hoping you can list some tent fabric dimensions so I can sew my own. Rake length, seam widths, stitching types, threads to use, and maybe some haversack instructions. Thanks and great job so far! Yes Mark, There is much to calculate if you wanted to make your own wall tent. I like to DIY many things and I can darn my wool socks when they wear out, but other than that, I am short on sewing experience. I suppose the seam width would depend on the thickness of the fabric that was used. Our wall tent is made from 10 oz cotton duck. I wrote a post about wall tent fabric and a post about how to determine the size of wall tent you needed complete with diagrams. 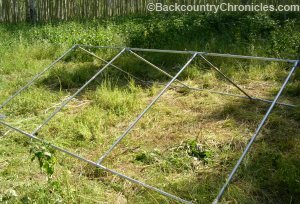 The roof on most standard wall tents seem to go from 5 feet high at the wall to 8 feet in the center (referring to rake length). Obviously, you could make your own tent any size you want and I have seen some tents that reduce the side wall and ridge height to save weight, but the purpose of a wall tent to me is to have a large area you can stand up and move around. The 8 feet in the center isn’t necessary to stand up for most of us, but the 5 feet along the wall is. And to get sufficient slope for runoff, you probably need at least 4½ inch drop for each foot (20.6° angle) as with a 16 foot wide wall tent. Our wall tent is 12 feet wide, so the roof goes from 5 feet to 8 feet high in 6 feet, which happens to be a 26.6° angle or a 6 inch rise for each foot. The roof on a 10 foot wide tent would go from 5 feet to 8 feet in 5 feet (30.96° or 7.2 inch rise per foot). This could be shortened to reduce materials and weight, but remember that your head will touch the roof farther away from the wall. The side distances can simply be calculated for every possible tent height and width using trigonometry; A2 + B2 = C2. Our tent for example would be 6 feet from wall to center ridge, and would rise from 5 feet at the wall to 8 feet at the ridge for a total rise of 3 feet. That would be 6 feet2 + 3 feet2 = C2, which equals 9 + 36 = 45. The Square Root of 45 = 6.708 feet, which is 6 feet and a “fat” 11/16th. So to measure the wall fabric, start at 5 feet high on one end and 8 feet high six feet away. The straight line from 5 feet on one side to 8 feet on the other across the roof line should be 6.708 feet. The seams on our tent is strengthened with 1½ inch webbing, so the seam width is slightly larger than 1½ inches. So be sure to remember to add 1¾ inch all the way around each panel. As for thread, I understand a strong, UV protected Nylon thread is recommended. Our tent was sewn mostly with double running stitches (yes, I had to look that up). A running stitch is basically in and out and by double, I mean stitched on each side of the 1½ inch re-enforced seams. All edges are also reinforced with “X” patterns. Let me know how your project progresses. I will be happy to help with designing a haversack after you have a tent to put in it. This is great. I’m going to tackle building one. With the 4 1/2 inch per 12 inch pitch is what I was trying to figure out. I don’t sew either but when I get the design done I’ll share with you and let you know what worked and what didn’t. I plan on using one piece that will go up the side then double back down the rake of the roof to the outer edge of the roof. This should add strength and a good solid base to sew tie offs onto all along the edge without having to add reinforcement patches. But I might add the reinforcement material anyway. The the material will go up and over the top ridge and repeat in reverse down the other side. This way, I won’t need to cut any pieces separately for the walls to be sewn on the roof. I’ll have to make doors of course to sew on but that seems straight forward enough. Overlapping the pieces so they can be tied off I think. Along the bottom of the walls I think I will add looped webbing to hold it down with stakes as well. For the bottom of the sides I thought about sewing on an edge that can be folded inward and go under a tarp so that if moisture did come under the walls it would go under a tarp inside. Another option might be to trench a shallow trench along the wall edges for water to run off into. Overall I really think you had a great site to visit to get some great ideas for someone who doesn’t want to spend hundreds buying a tent but has some level of skill being able to create one. Thanks for the reply and all of the information. Yes, I think using a single piece from floor, across the roof back down the the floor is wise. The material at the edge along the bottom of the tent is called a sod cloth. And yes, use a tarp or canvas to overlap the sod cloth. A sewn-in floor makes the wall tent too heavy and too hard to install an internal frame. I think reinforcement material is good especially along the ridge pole. Good Luck and send pictures.